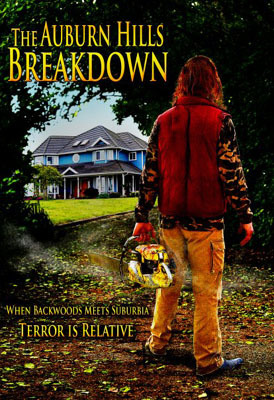 The Auburn Hills Breakdown is a horror comedy short about a backwoods cannibal family. 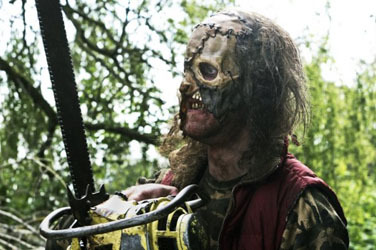 It's the story of Junior, the chainsaw wielding but fiercely loyal son, who struggles to hold his family together. Synopsis: A twist on classic horror film convention. Junior, a chainsaw wielding maniac, but fiercely loyal son finds himself on the wrong side of the picket fence, when the family truck breaks down, forcing them to seek refuge in the creepiest home imaginable. For this family, it's a Martha Stewart Special situated in the newly developed Auburn Hills Estates. Inside, they come face to face with the truly disturbing Louise and Dan, a yuppie couple who fled the rat race, renovated a farm house, are now bored out of their minds. However, they are determined to make country living work for them, even if it means resorting to blind political correctness and inviting a family of killers into their home.